Lake Shasta is at 32% of capacity. For us down here at ground level, it seems like things have really turned around. Our lawns are squishy again; trees are budding out; the rain breaks just often enough for the ground to soak it up, then starts up again. The problem — actually, the two problems — are that (a) squishy lawn at sea level doesn't translate to snow up in the Sierra, where our water comes from by the time August and September roll around; and (b) this is the third consecutive year we've had low rainfall, so the ground is simply parched — as evidenced by how fast my rain garden drains out. 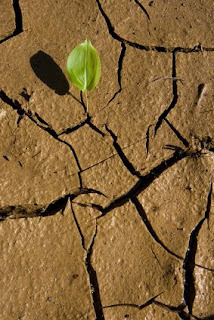 So I repeat my warning about getting water-wise: the drought is coming. Water, especially to irrigate landscapes, will be in short supply, expensive, or both. Gardeners, landscapers and homeowners will have to change the way we think. That will require no small effort, so lazy me hopes I'm wrong. But I drought doubt it. I never really take off my designer's hat, and so I'm always seeing examples of good and not-so-good designs. Two of my favorite places to look for both are corporate campuses and public works: not only do they have to satisfy technical requirements far beyond anything I'll have to deal with in a home garden, they also have the budget to do it right (not perfect, just right). If one of these megaprojects is successful, I steal what ideas I can, to scale to the residential scope and budget. And if one is failing, I feel like I've struck gold - because I can learn from their expensive mistakes without spending a dime of my clients' money. Prolonged rainy spells are great for pointing out problems in grading and drainage. Here's an example of what I consider a failure at the newly redesigned Caltrain station at California Avenue in Palo Alto: you can see the raised concrete planter has a drain outlet at its base. But where does that water have to go to drain away? Across a path (a wheelchair ramp, to be precise). This is, at best, an inconvenience for those of us whose shoes get wet walking through it. But at worst, it's a safety hazard no matter whether you're walking or wheeling. 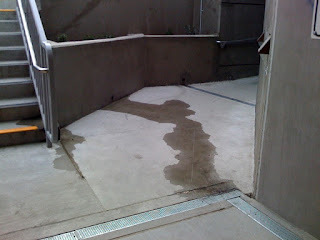 To compound the danger, this is below grade, where the perpetually cool and shady conditions encourage the growth of slippery algae on the wet concrete. To my eye, all this risk could have been prevented by simply including a drain at the base of the wall, or perhaps tying in the wall outlet to the slot drain beneath the walk. Either would have been a relatively cheap solution compared to the potential costs of the problem. I hope we never find out. 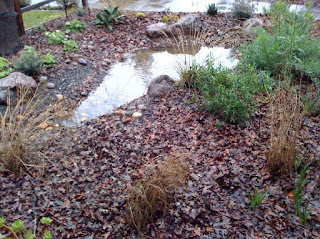 When you're designing your landscape, remember: water will always find its way downhill. I'll let you know if the City decides to address that little fact here. Twenty-four hours later, the billabong has percolated most of its contents back to the groundwater. I would guess there's about five gallons remaining here, and that's even with a steady light rain over the period. Platyglossis (Tidy Tips) I planted last year, which is more of a vernal-pool native, reseeds. This is probably 70 gallons of rainwater from the past 2 days. 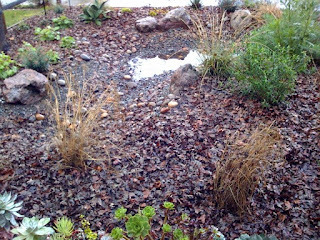 I am very pleasantly surprised that the "pond" is keeping pace with the rain; Palo Alto has had close to 3 inches so far. Not that a rain garden is the perfect solution for everybody's front yard, but I do get a warm fuzzy feeling knowing I kept this water (a) away from our foundation and (b) out of the gutter. Brian Doyle at Orion Magazine recently reviewed Rick Van Noy's A Natural Sense of Wonder: Connecting Kids with Nature through the Seasons. Brian gets it. And I need say nothing more. Since I wrote last summer about the threat of drought, things have gotten worse — much worse. The Sonoma County Water Agency has announced mandatory usage cutbacks of at least 30%. In the East Bay, EBMUD has called for 19% reductions, and implemented rate increases for all usage. Bolinas has already emptied one of its two emergency reservoirs, and is limiting household usage to 150 gallons per day (repeat offenders will have their water supply cut off). The Sierra Nevada snowpack is at 61% of normal, and the state's largest reservoir, Lake Shasta, is at 31% of capacity. So what's a gardener to do? For starters, kill your lawn. Turf is by far the thirstiest aspect of your landscape, and even if the water is available it's going to cost you an arm and a leg to keep it green. Next, audit your landscape water usage. Hire a certified irrigation contractor or irrigation auditor to ascertain whether your system is using more water than necessary. Are there leaks in your pipes? Could your run times be shortened? Could those spray heads be converted to drip? The investment will pay for itself. While you're optimizing your irrigation, optimize your plantings as well. Make sure your plants are grouped together by water need — ferns with dogwoods, sages with grasses, Carex well away from Ceanothus. While you're at it, take another look at some of your thirstier specimens: do you really need those hydrangeas and roses? Finally, when every drop counts, it makes sense to save every drop you can, and a rain-catchment system is one of the best ways. 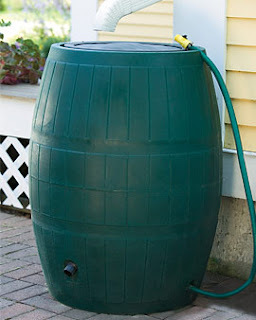 We've seen the traditional rain barrel any number of different ways, but there are a few other options available now, such as the Rainwater Hog which can mount either vertically against a wall, or horizontally beneath a deck. Don't forget, Santa Clara County is offering rebates for water-thrifty planting and irrigation updates. But whether you take advantage of the rebates or not, the time to make your garden water-wise is now.